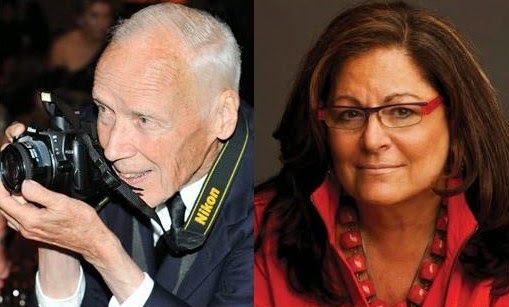 Recently, I had the pleasure of attending the “Fashion Icons with Fern Mallis: Bill Cunningham” at the 92 Street Y in New York City. I entered the the auditorium with several expectations. For example, I expected the presentation would be sold out. Check. Secondly, I assumed the audience would be largely women--partly because Bill Cunningham (above left) is a fashion photographer and partly because he has a very appealing personality. Check. Next, I expected the audience would be in either in the fashion business or interested in it, and consequently, stylishly dressed. Check. After all, it's Fashion Week in New York City. In fact, the presences of fashion people--including Norma Kamali and Carolina Herrera--were acknowledged by Ms. Mallis throughout the evening. And finally, I expected Bill to walk on stage with a camera slung around his neck and snapping photos of the audience. Check and check. What I hadn’t expected was the standing ovation Mr. Cunningham would receive before he’d even opened his mouth. The audience was on its feet the minute he walked on stage. That was the first surprise in an evening of many surprises. If you’re new to the Bill Cunningham phenomenon, I highly recommend seeing the documentary, Bill Cunningham New York, released in 2011. In it, you’ll find a hard-working, passionate, talented, yet humble and down-to-earth fashion photographer who has been photographing fashion on the runway and and on the NYC streets for over 30 years. Even if you have no interest in fashion, you can’t help but envy and respect this wise and wonderful chronicler of our times. When people think of Bill Cunningham, they picture him riding his bike around the city, taking photos. However, he once owned a 1934 Rolls Royce. While working at Bonwit Teller, he dyed one of Jackie Kennedy’s suits, so she could wear it to President Kennedy’s funeral. "There wasn’t time to get fabric and make a new suit," he said. His favorite fashion show was the Battle of Versailles Fashion Show in 1973. The 'battle' was between old world designers (such as Yves Saint Laurent, Dior, and Hubert de Givenchy) and American newcomers (such as Oscar de la Renta, Anne Klein, Halston, and Stephen Burrow). The Americans introduced ready-to-wear fashion at the show. "At the end, everyone threw up their programs and ran backstage. The women wanted the clothes designed by the Americans!" Prior to walking out on stage, a reporter asked Bill what he thought his legacy will be. In typical Bill Cunningham fashion, he replied: “I told him, ‘Who has time to think about legacy. I’m too busy working.’” Bravo, Bill!